Sani sticks As seen on Tv is the best way of keeping your drains clear and odor-free. This stick is highly biodegradable which have powerful enzymes that are 100% safe for septic tanks, plumbing, and the environment as well. Check our detailed Sani sticks reviews 2019 here. It is very difficult to keep your drain clear and odorless. Sani Sticks are drain cleaning and sanitation sticks which are specially manufactured to stop greasy buildup, unpleasant smell. It can even dissolve food, organic deposits, hairs, and other substances. These sticks are highly concentrated that it can effectively prevent drains from clogging. According to its manufacturer, every month you only need to drop one stick into the drain. It can be used in the room, bathroom, kitchen, or anywhere else. After it gets inside the drain, it releases highly concentrated enzymes that remove clogs, backups, and odors. Sani Sticks As seen on TV made up of powerful enzymes that can dissolve organic deposits and greasy buildup. Also, it is completely biodegradable. Sani Stick looks like a coffee swizzle stick and is blue in color. To use Sani Sticks, According to manufacturer instruction all you have to do is just to stick it down your drain. The company claims that Sani Sticks will start working naturally to dissolves substances like grease, soaps, hair, and other wastages that clog your drains. Also, it releases pleasant smell.The company claims that it prevents the buildup of messy clogs, and can save you hundreds of dollars. Most of its user gives it a positive review. But some of them also complain that the product doesn’t work as promised. And also their customer service is not too satisfactory. Apart from these concerns, Sani Sticks mostly gets positive feedback. Most of these positive are associated with the easy ordering method, reasonable cost, and very simple application and so on. Many people were saying that after using this product they forgot those unpleasant smells completely and this item works really good! Many users said that they have tried so many different products to clear their clogged drains but nothing really worked. But when they bought this Sani Sticks and used it, it works effectively and effectively eliminates foul smell. Another advantage of the using this sticks is that it will be effective for one month, as compared to other similar products.You can also read Sani sticks reviews on Amazon as well. Dimensions The bag is 11 ½" X 5 ¼", Plastic ring is approximately 6" in diameter, and the hole in the plastic is 1 ½" diameter. ULTRA CONCENTRATED strips for powerful cleaning and deodorizing of household drain lines. Smelly drain? 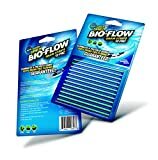 Bio-Flow Drain Strips will eat away at organic matter better than the no-name drain cleaner you have under your sink. Drop one strip into your drain and the slow-dissolving bacteria and enzymes will start to work instantly. ELIMINATES & DIGESTS grease, oil, fats, scum and food quickly for easy drain cleaning. The gunk that's stuck inside of your drain won't stand a chance against Bio-Flow's enzymes. Grease, oil, fats, scum, food: all gone in a matter of minutes. How's that for easy drain maintenance? UTILIZES POWERFUL YET SLOW DISSOLVING enzymes to take care of lodged organic materials. Food and grease will stick to your drain like Velcro. Pretty gross. Luckily you can clear the gunk in your drain with a Bio-Flow Deodorizing Strip. PERFECT AS PART of a monthly drain cleaning routine. Traditional Use: Once a month, drop one Bio-Flow strip into the drain for cleaning and deodorizing. Perfect for kitchen and bathroom drains. are the competitors of Sani Sticks. They are not as efficient as Sani Sticks. But if you want to try them you can try. Also, Read our Clorox Scrubtastic Reviews which you can use to clean your bathtub, shower or sink without using harsh chemicals. I personally recommend this Sani Sticks as this product comes with a great number of advantages. One of the biggest advantages is that it is made up of natural sources that mean it is completely safe for all types of plumbing and septic tanks. Additionally, this drain cleaners are environmentally-friendly, ease of use, and also cost-effective. So according to me, the Sani Sticks are an excellent choice for controlling foul odors which are coming from your sink or tub. Although, they are slightly thicker that creates difficulties in inserting them into some drains. While we give the product 4.5-star rating for odor reduction. Its ability to reduce clogs is average. But it efficiently helps to prevent new organic clogs from forming. After reading our Sani sticks reviews 2019 what do you think about this product? whether it is important for you or not. do share your reviews in our comment section. Also, want to know more about it then read customers Sani sticks reviews on Amazon. SMART CLEANING: Sani Sticks cleaner, deodorizer and clog preventer are a powerful, safe and efficient way to eliminate embarrassing, foul odors from drains and helps to prevent clog backups in sinks and showers. Its non-toxic formula is gentle and safe on septic tanks and is available in multiple scents and count varieties. ONE STICK IS ALL IT TAKES: Made with powerful, natural enzymes, each Sani Stick slowly releases a super concentrated blend of powerful enzymes that will eliminate organic deposits and grease build up for 30 days. Just one Sani Stick a month is all that is needed. INNOVATIVE DESIGN: Sani Sticks drain deodorizer and cleaners are thin, cylindrical and only 6.3 inches long making them ideal for homes and businesses. 100% safe for all types of plumbing, the stick rests in the pipe-trap and slowly releases a blend of enzymes that break down food, grease, oil and other organic materials. 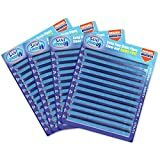 SAFE TO USE ANYWHERE: Because these odor eliminating drain sticks are non-toxic and use enzymes to clean, they are safe to use in all drains from the bathroom to the kitchen. MONEY SAVER: Avoid embarrassing smells and nasty water build up all while saving time and money. Rather than hiring a plumber or purchasing drain snakes, simply insert one stick a month into all your drains to keep water flowing and drains smelling fresh. I will personally recommend this Sani Sticks to use this product. The product is associated with a great number of advantages. You can go for it.